The three year old class laces a single thickness. The four year old class laces two pieces of paper together for form a stocking which can be filled. 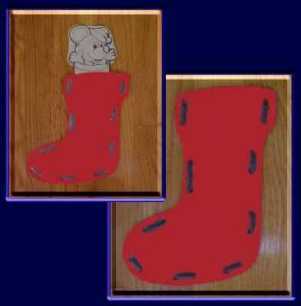 To make the stockings run outline of a stocking on sheet of red construction paper. Mark location for eyelets. Have students cut out the stocking and use hole punch to make the eyes. Four year old class will cut out two stockings. Place one on top of other and punch. Then lace the two together. Provide the four year old class with an image to cut out and color and place in the stocking. Make laces at least a day ahead by cutting yarn an appropriate length and dipping ends in Elmer's glue to prevent fraying.